Our greeting in the morning! Well, we have a flock of birds around the marina that like to perch on the rigging of sailboats. They also like to eat some vile berry that becomes black when processed by their digestive system. It stains fiberglass instantly. The only thing I've found that gets rid of the stain is undiluted bleach. If anyone has other ideas, let me know! 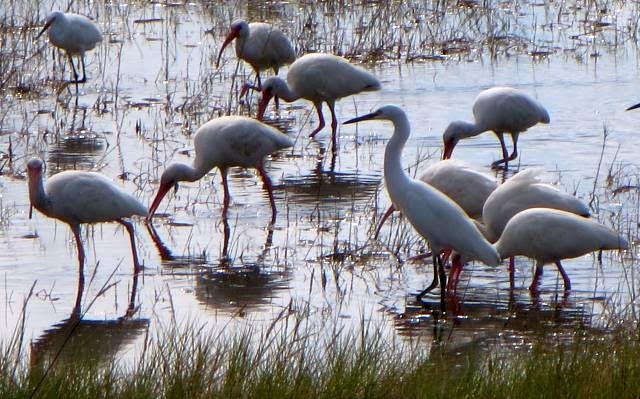 So after the morning's entertainment from the birds and subsequent clean up, we left for the Merritt Island Wildlife Refuge. 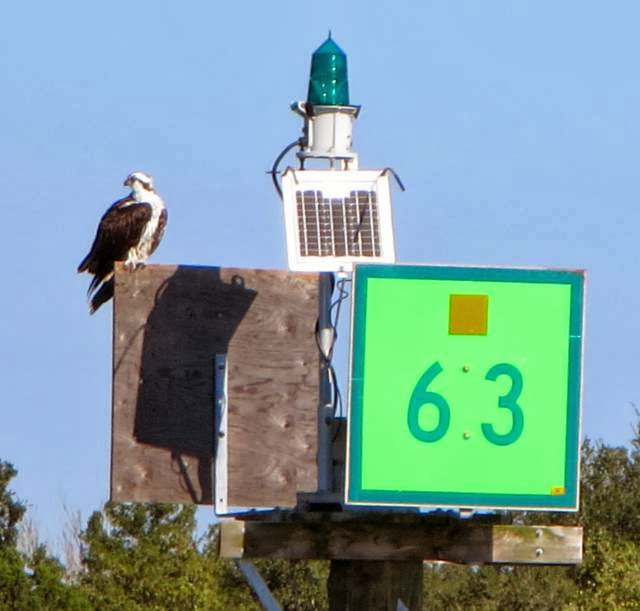 It's a by product of the Kennedy Space Center since they didn't need the entire island for their launches, less than 2% in fact so they established the wildlife refuge on the unused portion. It's a great resource and we spent all day walking and driving through the area. It's a wintering over spot for a lot of northern species, just far enough south but not too far. 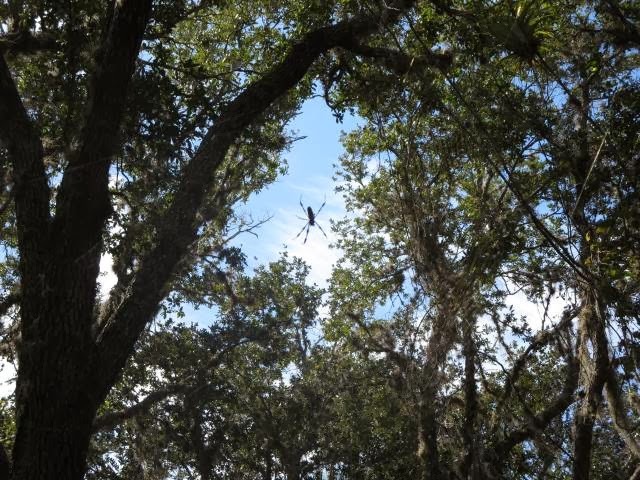 Now that's a large spider! For those who have been following the blog for the past few months, our travels this year have come to an end. 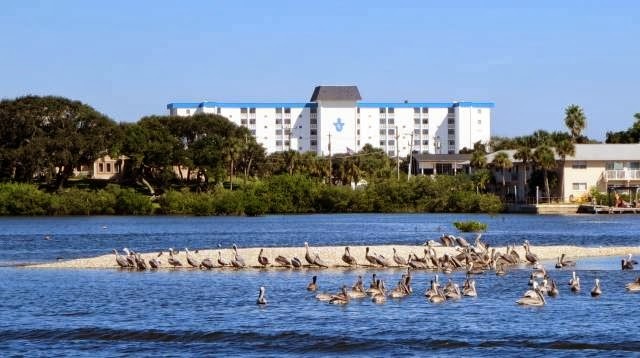 We'll leave Fleetwing at Titusville to take advantage of their $10/ft monthly rate and return north for the holidays. 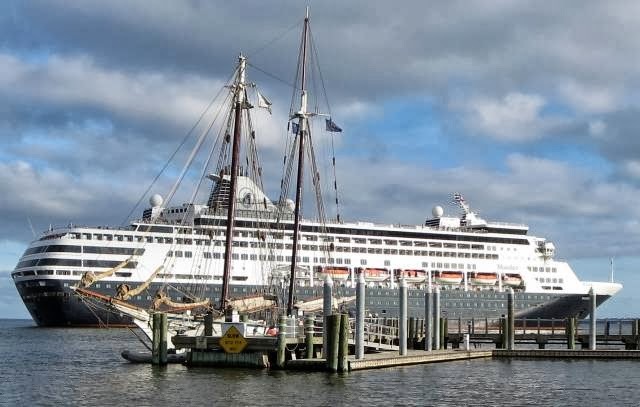 We'll return the first week of January to continue our cruise down the ICW to Key West to be followed by a return trip to the Poughkeepsie Yacht Club in late May of 2014. However, I'll keep the blog active as we explore the Titusville area until our departure on 11/21/2013. I do the blog for my own amusement but all are invited to read it - we're just not traveling down the ICW for awhile. 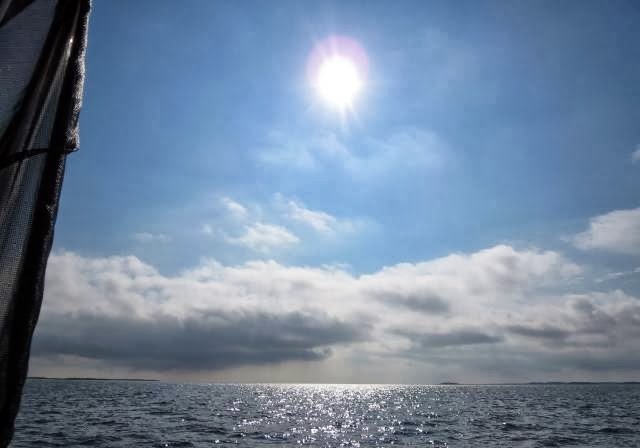 For those only interested in adventures when we're cruising down the ICW, check back in early January - otherwise you're still invited to stick around. Joe left this morning for Boynton Beach where he has a condo for the winter months. He spends the summers at the Poughkeepsie Yacht Club on his boat and the winters in Boynton Beach. So he has the best of both worlds, warm weather all around. 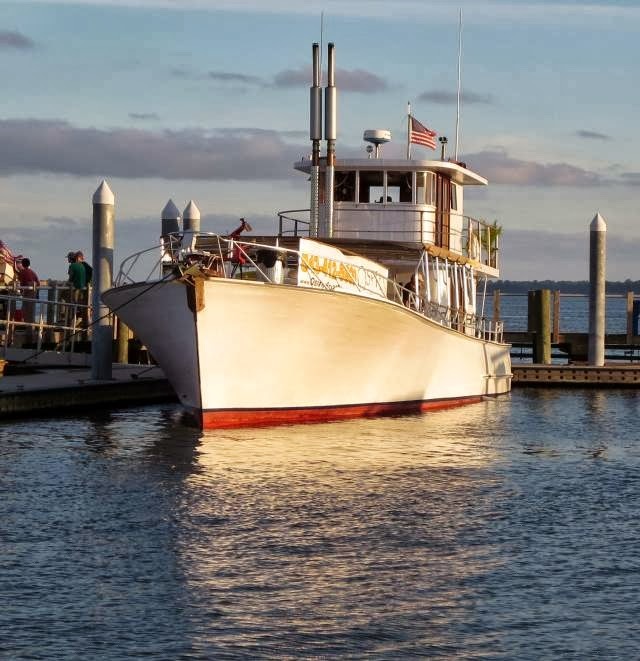 Our stay at the Titusville Municipal Marina has been so pleasant that we've decided to leave the boat here instead of at Stuart when we return to New York for the holidays. The marina was willing to prorate the $10/ft monthly fee for the partial month we'll be here in January. That's a little under $14/day for our 42 ft boat, or $0.33/ft per day, not a bad deal. With that we'll have more time to explore the area and enjoy the warm weather before heading north to the cold climes! 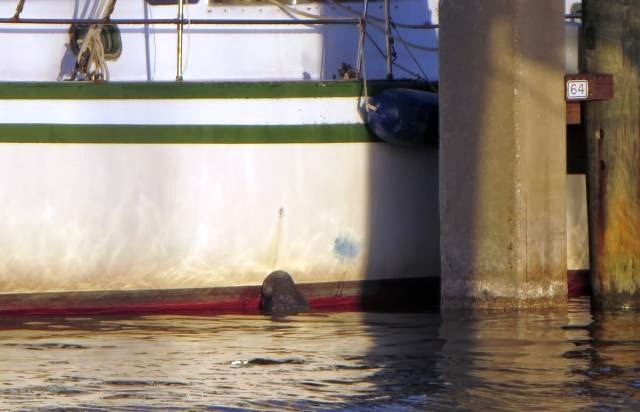 The birds left a mess on one boat which the captain was washing off - leaving fresh water to drain - which attracts Manatees! Every boater's friend is Walmart. With the advent of including groceries in Walmart Supercenters, it's a one stop shopping experience for a boater. We're fond of one of the quick meals they offer in the form of a pound of BBQ pork by Jack Daniels. It was $3 cheaper at Walmart than at Publix, $5 vs $8, enough to pay attention to. So fully stocked once again, we headed back to the boat and Hoolie's turn at the dog park making buddies with all the other dogs there. He just runs and runs and runs. 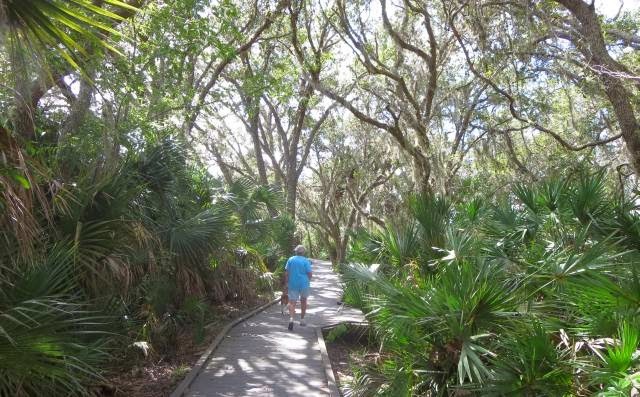 We plan on visiting the Merritt Island wildlife reserve on Thursday and enjoy their nature walks and look at the local wildlife. We have a list of gardens and wildlife areas we want to be sure and see over the next few days. We also finally got our flu shots today in time for our trip north for the holidays since it takes about two weeks for the shop to become effective. I reserved a car from Enterprise for a week to have wheels for exploring the area. The total cost including all taxes and fees came to $175 for the week which I thought was very reasonable for a full-sized car. 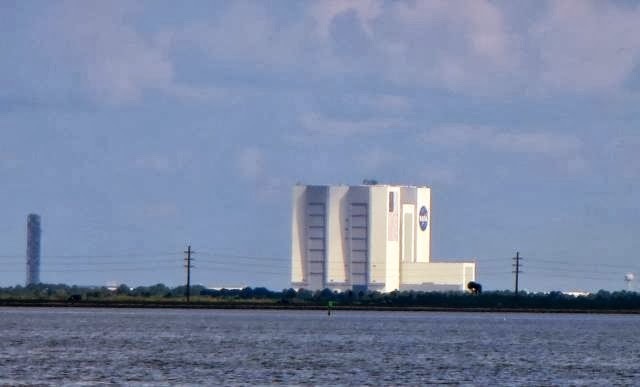 So we plan on visiting the Kennedy Space Center again as well as Merritt Island and several attractions inland (but not Disney World, not a favorite of Ann). So while I was getting the car I got a call from Joe Mastri. He was on his way south for the winter and called to pay a visit. Earlier that day we made a call on the nearest Publix supermarket to provision for the rest of the trip and buy a rotisserie chicken for dinner. What's one more for dinner? Not a problem. Joe partook of the chicken and has a comfy bed in the aft cabin for the night. He'll head out in the morning for his condo in Boynton Beach for the winter. We'll continue on exploring the area and enjoying the nice weather which is forecast to be in the 70's all week! We're settling in here for a long stay before heading north again. The marina has super protection and the slips have huge pilings to tie up to. Add in the fact that there's no current or tide, it's close to ideal - especially with the $10/ft rate for a month's stay. It's the least expensive monthly rate on the florida coast. Our TV antenna picks up 35 channels and the marina has free WiFi at a 6 Mbps rate, very good indeed. We may be here for awhile. Another beautiful day in paradise. Not much wind but with temperatures in the 70's, who cares? There's no rain int he forecast for the next week so south we went. The anchorage at Rockhouse Creek last night was like being on land, still and no rocking. We though this was just another abandoned boat but then look at the caption - they have a website! 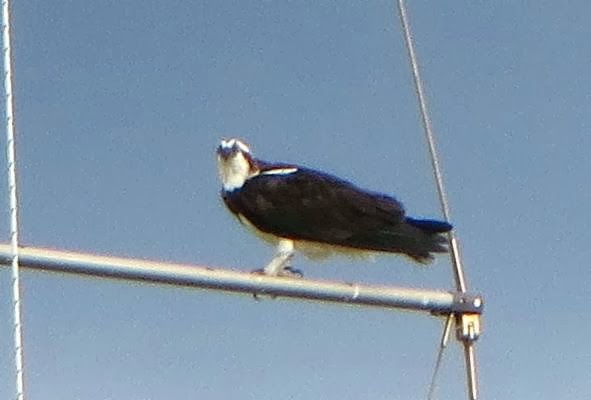 We saw dolphins and manatees along the way south along with ospreys and more. It's like being in a marine park (which we were part of the time). We passed under the Haulover Bridge which is used by the Kennedy Space Center to move equipment for launches. There were no delays today since there were no launches due in the near future. 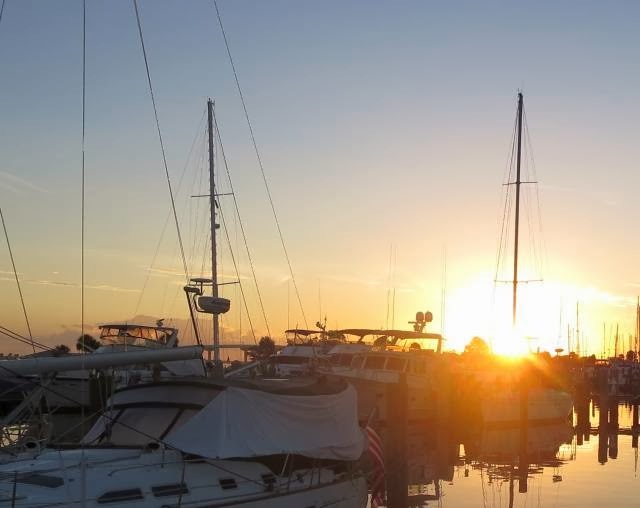 So now we are settling in at Titusville Municipal Marina for a couple of weeks to enjoy the weather and explore the surrounding area. I have a car reserved for a week starting Tuesday and we'll see what looks interesting. We'll probably revisit the Space Center since I already have a pass from the spring and the Merritt Island nature center. 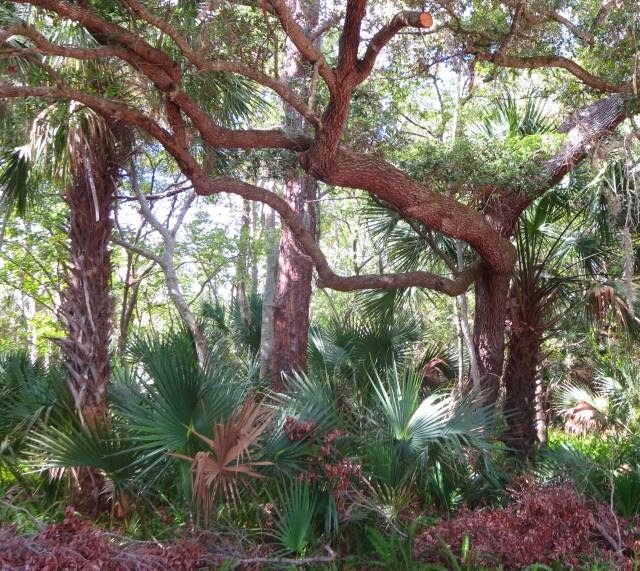 Turning inward, we'll look at nature preserves next to the Indian River. It's all in the name of having fun in the warm weather. Also on the agenda is getting back in shape for me (4 mile runs) and doing laundry. It's hard not to really enjoy the great weather, we're looking forward to it. 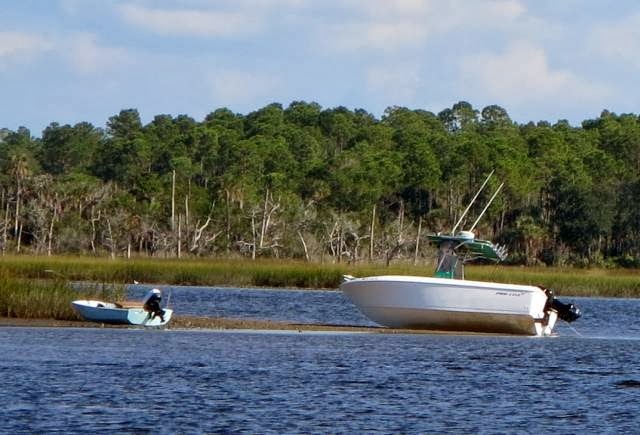 Unlike Georgia and South Carolina, Florida has been hard at work making the waterways safe for boaters. We've seen more dredgers in Florida than all the other states combined, no contest. We passed two more just today dredging inlets where we barely got through in the spring. It's a great relief to see 14 ft of water where you saw barely 5 ft in the spring (or less!) So at any rate, we made great progress today and got down to Rockhouse Creek anchorage. As we came into the anchorage, there was even a dredger in place but they had put two white buoys in place to mark a temporary entrance to avoid their dredging hoses floating on the surface. One thing we've noticed this fall was the extraordinary number of jellyfish. The water was thick with them with one every foot or so. We've never seen them so thick. We had the genset running this morning and all of a sudden it quit. When I went into diagnostics on the genset menu, it said the cause of the shutdown was low seawater pressure. In other words, lack of cooling water coming through the seacock for the genset. It appears that a jellyfish got sucked up into the intake opening and clogged the flow of water. I took the washdown pump from the anchor locker, ran a hose to the cockpit and flushed out the seawater input hose to the genset. Once that was done, I restarted the genset and it seemed to work fine. I never ran into that before! On Monday we pull into Titusville for a week's stay. We'll also rent a car and see the sights nearby. Hoolie will enjoy the dog park right next door and we'll provision and do laundry and have some fun. We had some more skinny water today, this is beginning to be routine, not good! On the other hand, we've seen more dredgers in Florida than all the other states combined. They want to attract boaters, the other states couldn't care less. So we made it through today without much spare room under the keel but make it we did. After a few trips you start to recognize the shallow spots and say, "Oh yeah, I remember this place, you've got to go to the green side to get by..." I dutifully update Active Captain so those following me south will have more to go on than I did. We refueled at St Augustine. Ann does most of the boat handling now. She took us out of Harbortown and into the fuel dock at St Augustine, she's getting a very good feel for the boat and how it responds to wind and current which only comes from experience. I still do most of the navigating through skinny water where there're cautions on Active Captain but she's starting to do a few of those too. 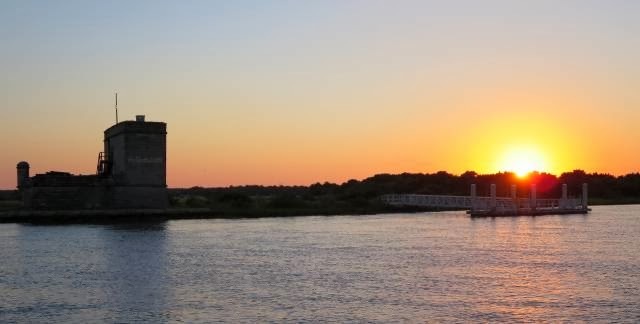 We anchored tonight at one of our favorite anchorages on the ICW, at Ft Matanzas. It's actually a real fort form times before there was even a United States. The Spanish had control of the area then and were guarding against an attack from the French through the inlet and up to St Augustine. the park service runs a free shuttle to the fort with a tour once an hour and we're anchored right out in front. We plan on continuing on Sunday to Rockhouse Creek and another anchorage, the price is right! Like here, it also has Hoolie relief, a must for us. The weather is predicted to warm up finally into the low 80's over the next few days, nice. We came through some very skinny water on the way here, much more so than I expected. One of these days I hope they do some serious dredging. On the plus side, I did see two dredgers set up this afternoon and one was actually working. Even with a 4' 9" draft, there were places today where I would have been aground in the channel at low tide. With a 3 foot tide, I made it through okay. 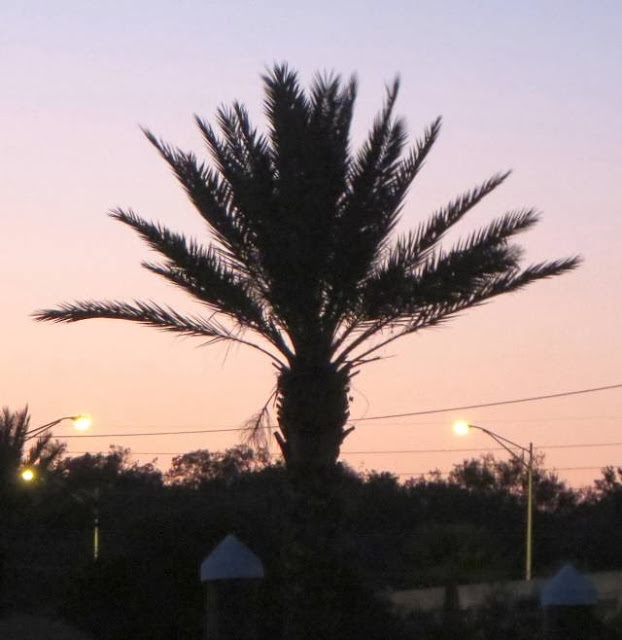 A setting sun, a palm tree - we're down south! We've always stopped at Harbortown just north of Jacksonville. It's a community of condo owners that rent out their slips to transients. However, they've had a bad experience with a couple of people in boats. Some skipped out without paying dockage and another couple found something to trip on and sued the marina for $5000! Now Florida is a no fault state for insurance and $5000 isn't enough to recover lawyer's fees to challenge so they paid the claim. The really sad thing is that it was all a scam. 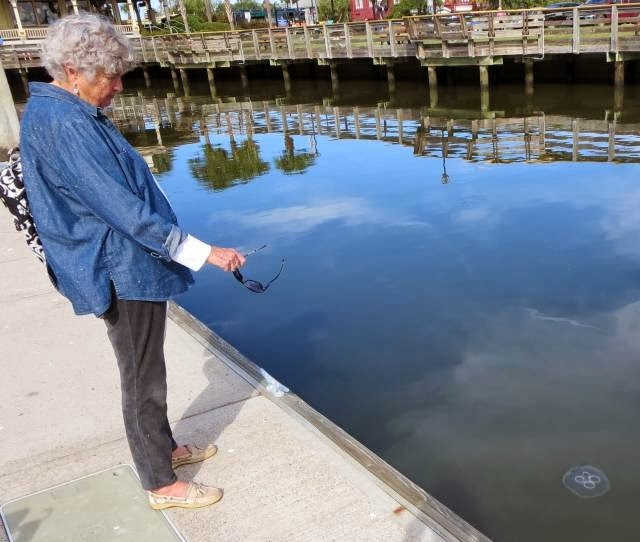 A few are preying on small marinas like Harbortown for cash so now the marina is no longer accepting transients. This is very sad that the irresponsible behavior of a few is affecting the majority. Why can't people just be honest?! I know of one other marina just south of here where the same thing happened to them. They are by an anchorage area and they allowed people to tie up to their docks to get to shore. No more. Someone sued them over some supposed tripping problem so their response was to put up signs that boaters are not welcomed to dock their dinghies any longer! It's disgusting! Luckily, the dockmaster here knows us so we were accepted in for the night but all others were turned away. It's a perfectly protected marina and we'll be calm here for the night. We're aiming for Ft Matanzas on Saturday as the weather here starts to warm up, only in the low 70's today. An art gallery in town has local artists. Nice display. 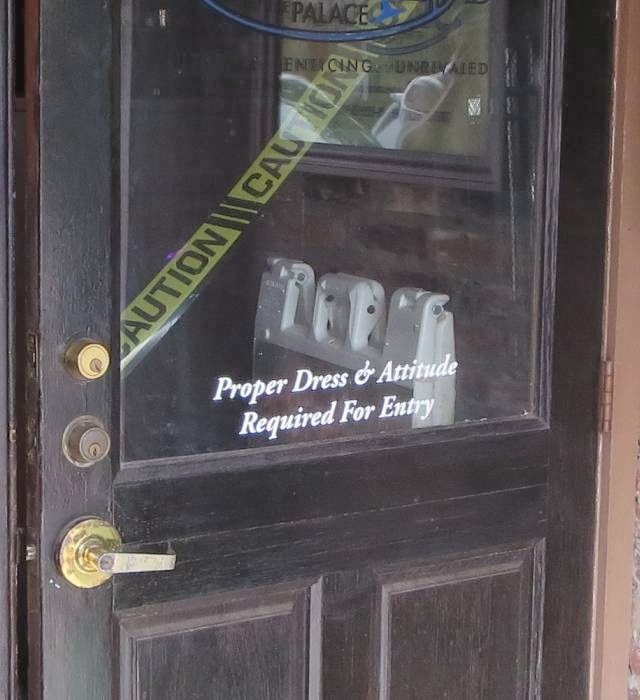 Humm, proper attitude required too? The winds have died down and it's perfectly calm now, not a whisper of wind. The high Friday will barely reach 70 but it will warm up after that. I think that the next time we come by we'll just anchor out. The mooring is closer to the docks but for $20 I can motor a little further. I was repairing the galley faucet this afternoon when the end snapped off and I was left with a useless shower head and the remained jammed into the supply hose, impossible to get out. With that I order a new shower head from the manufacturer. This thing is supposed to be high quality but the part that broke off was plastic, ugh. Now Ann has just a hose for a water supply in the galley until we get to Titusville when the replacement part will arrive. It seems that there's always something breaking on a boat. 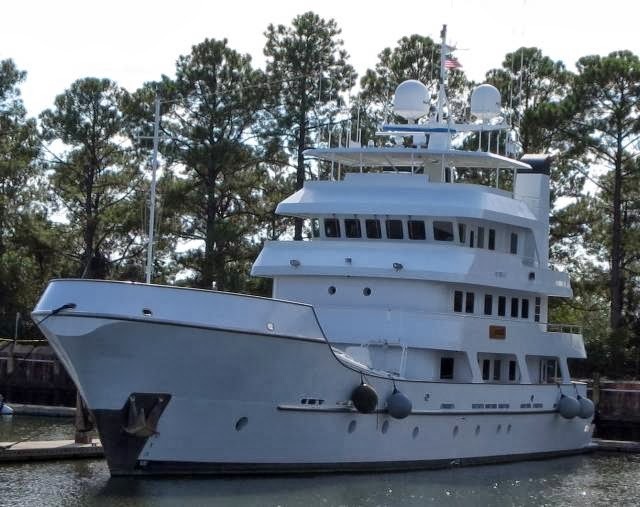 We'll leave Friday morning for Harbortown marina in Jacksonville, we know the dockmaster there and we've stopped on every trip south so far. 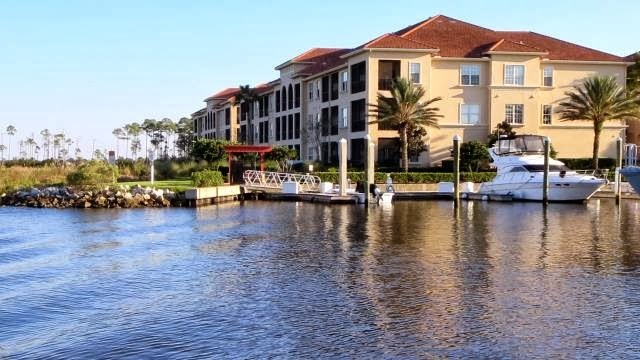 It's very protected and less expensive than at a large marina in Jacksonville itself. 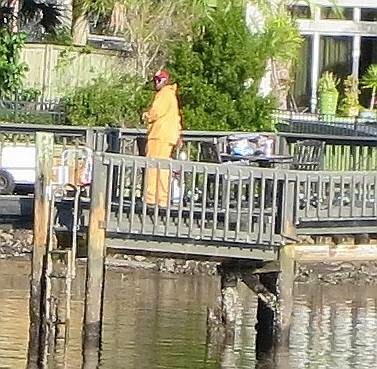 It's nice to be in Florida, they take care of their part of the ICW! 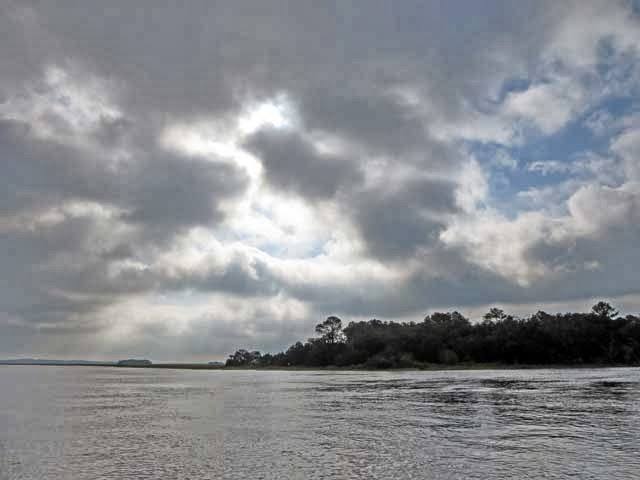 The winds were predicted to peak in the afternoon to 20 to 25 kts which is definitely not good for rounding the corner out the inlet by Jekyll Island. 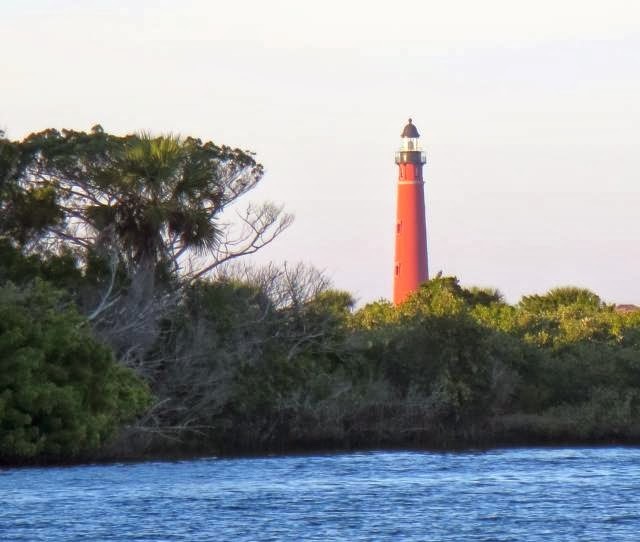 For those not familiar with the area, you have to go out the inlet for several miles before you can turn south again in order to avoid a shallow bank. With the tide coming in and a strong wind going out, that section can be very rough. With that we decided to take advantage of the morning wind before it built up to afternoon strength. So it was up before daylight with a trip to the nearby public dock for Hoolie and off the anchor by daybreak. We had winds of 15 kts but that's a lot less than the 20 to 25 kt predicted for the afternoon. Another complicating factor is that you have to make a right angle turn over at most 10 ft of water over a bar before you can turn south again. Waves like to break over a bar but it was calm enough this morning that we made it okay and without breakers. We do like to see these around!! 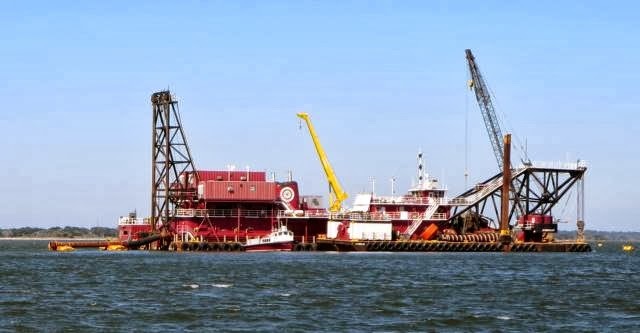 They are dredgers to keep the waterways from getting too shallow. Coming into Fernandina was an adventure. We only had to pick up a mooring but there's a 2 kt current running most of the time and that combined with the 20 kt gusts (by the afternoon when we arrived) made picking up a mooring an adventure. On our first try the mooring ball went under the boat, not helped by the fact that it was covered in very sharp barnacles so I was hesitant in grabbing hold of it firmly. Finally I was forced to let go and it slipped past Fleetwing. On the second try we decided to approach the mooring ball from the downwind side which would prevent it getting under the boat and we were successful securing our lines through the eye. The ride in was thrilling with the 25 kts winds (by now) so on the way back I had Ann sit in the back of the dinghy which raised the bow to almost eye level which kept the dinghy and its passengers dry! Tonight there's only about 8 kts of wind, perfectly still it seems. We'll be here another day before heading south again on Friday. 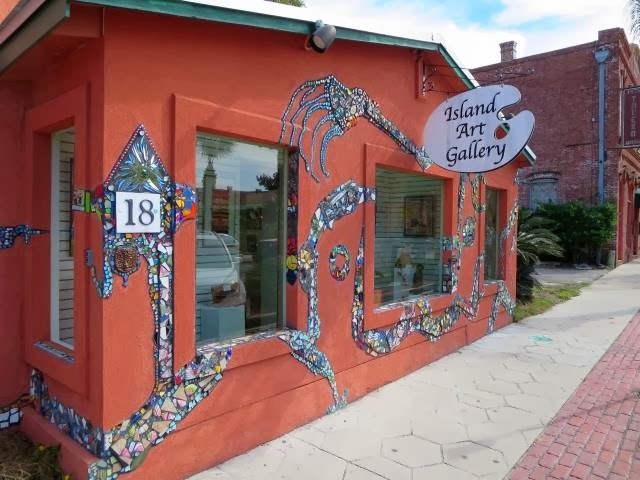 Tomorrow we'll explore the many shops in Fernandina, one of Ann's favorite stops. It was mud city once again for Hoolie. he sunk in to his ankles in the river mud as he scampered up the slope to do his business. He was a mess hopping back into the dinghy - as was the dinghy when we returned to the boat! Ann showered him on the swim platform and did manage to get him fairly clean. Hoolie has a habit of grooming himself somewhat like a cat so at the end of the day he was pretty clean. The Wahoo River anchorage is great for wind protections and wake protection but lousy for taking a dog ashore because of the mud. 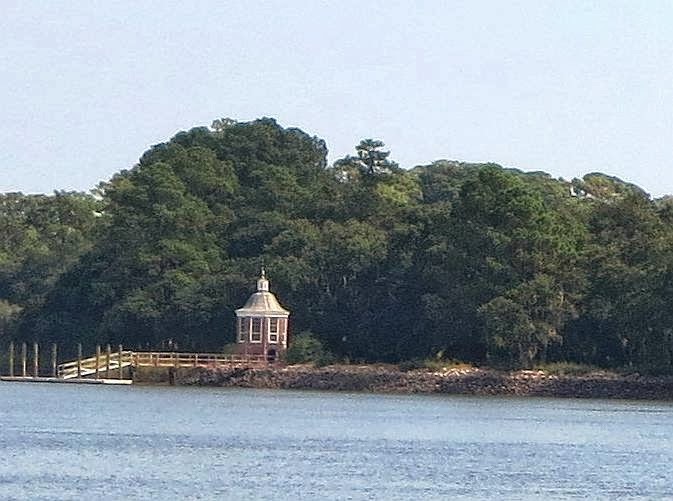 Our next anchorage will have a dock (at Jekyll Island). Thunderstorms were predicted for most of the day and we saw them on radar all around us but somehow they all missed us! 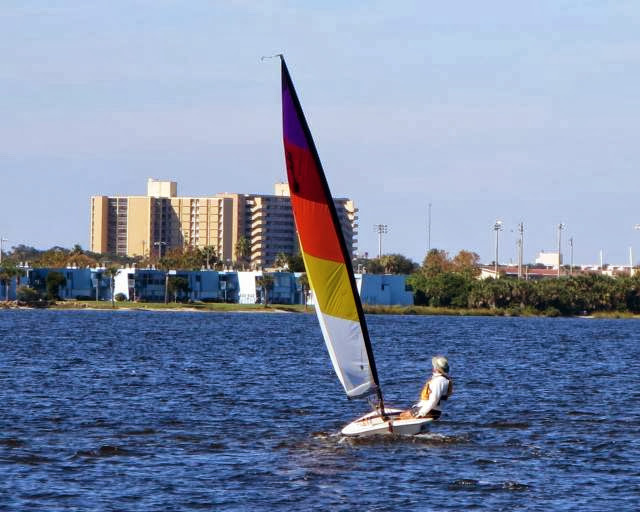 The wind wasn't much to worry about so we motored on south and continued our love affair with the weather on our trip south this fall, just perfect. 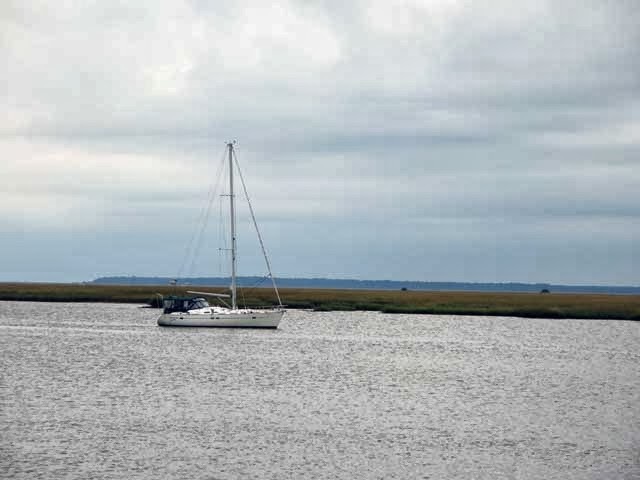 In the Jekyll island passage we came in with 5.5 ft of tide and would have been aground if we had came in a low tide! The water depth doesn't seem to be consistent since I followed the same course I did in the spring but found about 4 ft less water. You have to watch the wind tides down here in addition to the regular tides caused by the moon and sun. 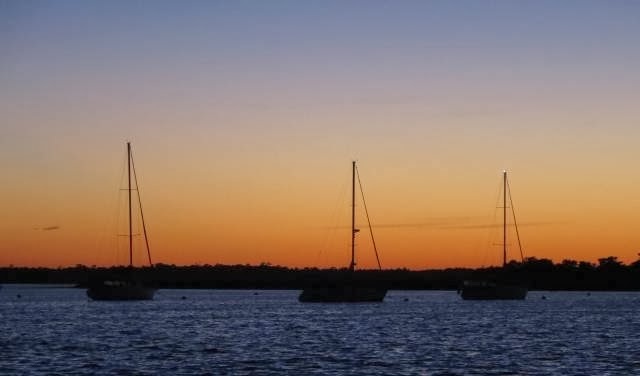 It's perfectly still tonight with no wind and on Wednesday we only have 23 miles to reach Fernandina where we'll stay for a couple of days on a mooring. 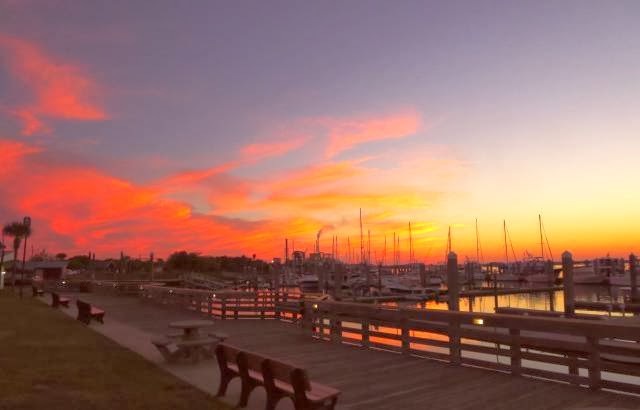 Fernandina is a fun town to explore and walk around and we'll enjoy finally reaching Florida! Hurray! The day dawned overcast but still not cold, good for going south (where the weather is warmer!) Our challenge today was getting through "Hell Gate" just south of Savannah. It's a short cut that can be rough and shallow but with an 8.3 ft tide that we had, it was no problem. The secret to going south on the ICW is to get in sync with the tides so the high tides are due late morning to early afternoon. With high tides of 6 to 8 ft down here, that strategy gives you a lot of leeway. Some have asked, "What do you eat while on the trip south?" 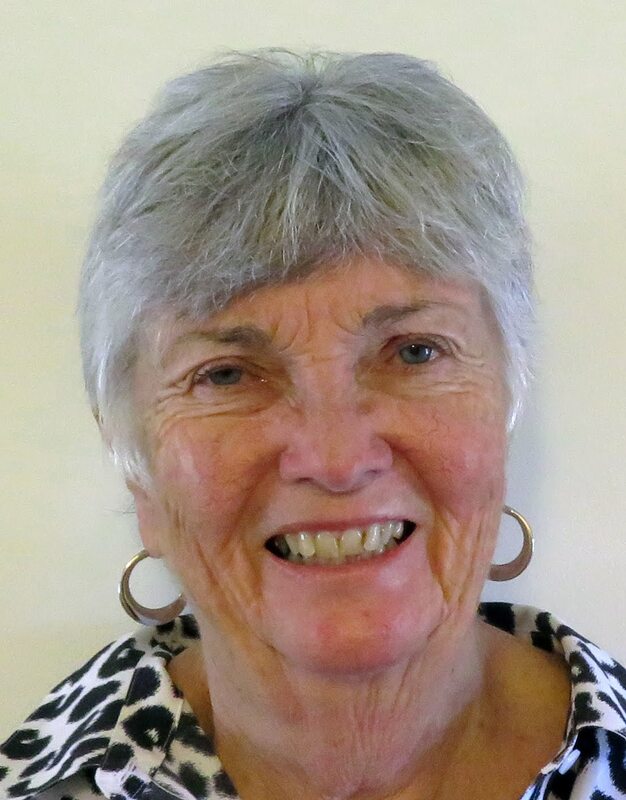 We may average eating out once every two weeks or so but mostly Ann prepares wonderful meals. For example, tonight she made Beef Stroganoff from a frozen steak we had (cut into strips) with fresh onions, butter, garlic, Worcestershire, etc. per the recipe. That came with a pear salad with crumbled blue cheese and for dessert she prepared Apple-Maple Turnovers. 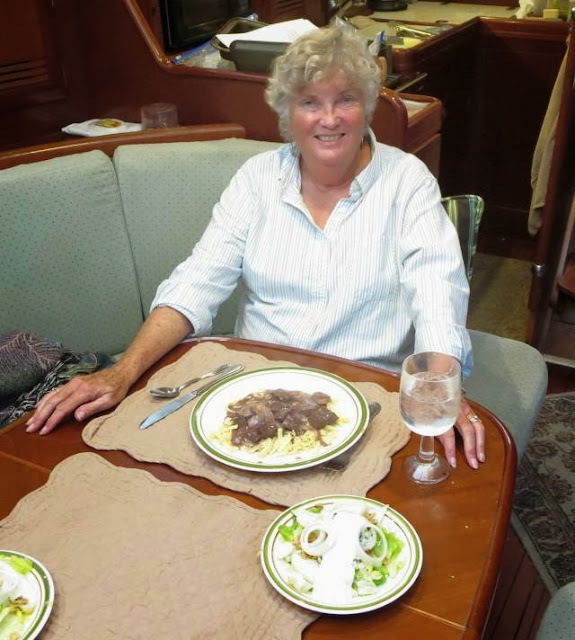 It's great to have a good cook aboard on the trip south, I highly recommend it! Ann with her another great meal! The captain is very happy! In the morning, we're headed for the Jekyll Island anchorage, our last stop north of Florida - then it's the Sunshine State!! We only had 23 miles to go so we had a leisurely breakfast before casting off from Hilton Head. We made sure we had the tides with us since we had Fields Cut ahead of us, one with a very bad reputation for shallow water. A long time ago (dark ages?) it was once dredged but no time in recent memory and as a result it has filled in. Now the charts bear no relationship to the actual depths nor where the deepest water is at. I came through with an 8 foot tide so I had plenty of depth in trying to find the deepest route through. 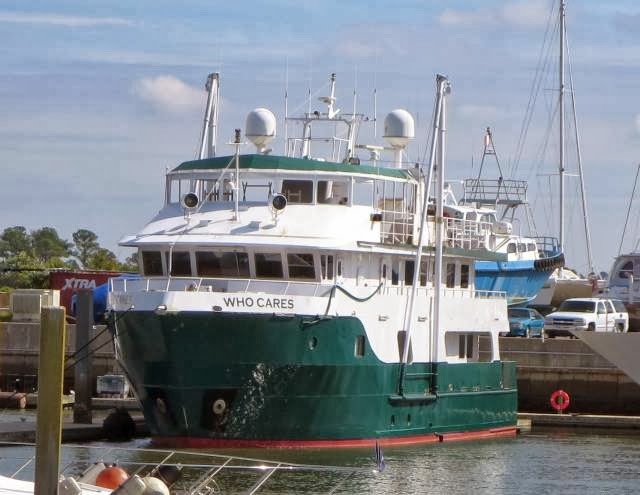 Who would name a ship, "Who Cares"? I tried one bit of advice in going out of the channel to the green side on the northern entrance and out of the channel on the red side at the southern exit. It worked like a charm and I had 10 feet of water even at low tide in a place where many boaters were plowing mud when they followed the chartered channel. I made an entry into Active Captain so other boaters would know the deepest path. Surviving that bit of trauma, the rest of the trip in was calm. We're at a dock presently at one of the big yacht marinas, big as in size of yachts they service, not in the number of slips they have. 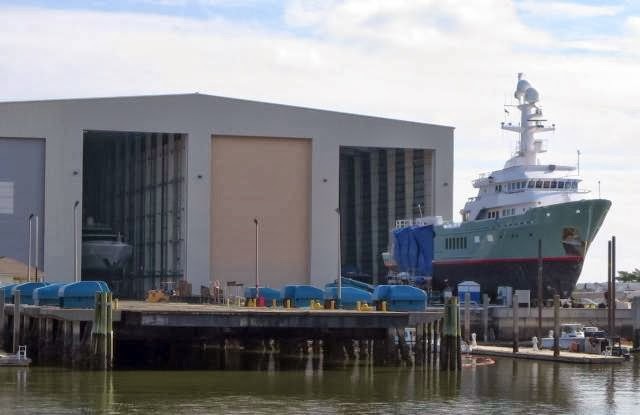 These are true ocean going ships that are undergoing maintenance by the yard (see photos!) We feel rather puny here, we're the smallest boat in the marina. Later that afternoon we had a visit from Jack Cothen who also brought wine and cheese and good conversation. Jack's from the Poughkeepsie Yacht Club and we always try to get together when we're in Savannah. It's great fun meeting friends along the way south. On Monday we're headed to Wahoo Creek to anchor out. It's out in the boonies with nothing around but it has good holding and protection with a nearby beach for Hoolie relief. It's just an overnighter before our next stop at the Jekyll Island anchorage. Today we had to cover 54 miles in order to take advantage of the high tides. This section of the ICW is another example of poor maintenance of depths. The ICW is supposed to be maintained at 12 feet mean low water (MLW) but here it's closer to 4 to 5 ft MLW. The Army Corps of Engineers (ACOE) just says they haven't got the funding they need (i.e., don't talk to us, go see your congressman). Being from New York, our own congressman is not too interested in funneling money to South Carolina and Georgia. We all depend upon the local marinas and town to complain loud enough to be heard and cause action. At any rate, given the 7 to 9 ft tides down here, at least it's possible to make a passage at high tide over land that otherwise would be bare ground. The extraordinary weather continued and we made Hilton Head by 3:00 pm, leaving Steamboat Creek at 7:30 am. We navigated a who's who list of shallow cuts but with a 7 ft tide, they had no teeth! Through two of the cuts we would have been aground at low tide even with our 4ft 9 in keel. Everybody was out today to take advantage of the high tides. We were in a string of four sailboats which we eventually all passed (they cruise shower than we do under power). We're at Hilton Head RV Park and Marina which we stayed at last time. 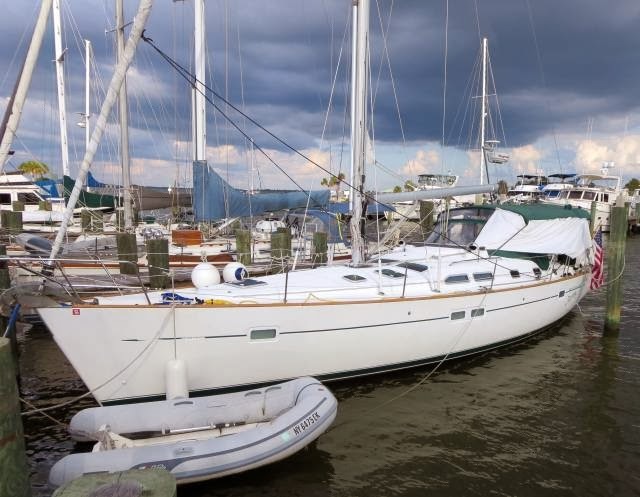 It's conveniently located about 20 miles north of Savannah so it's a short hop to our next stay which will be at Thunderbolt Marina in Savannah. We tried getting into Hinckley but they're closed on the weekend. 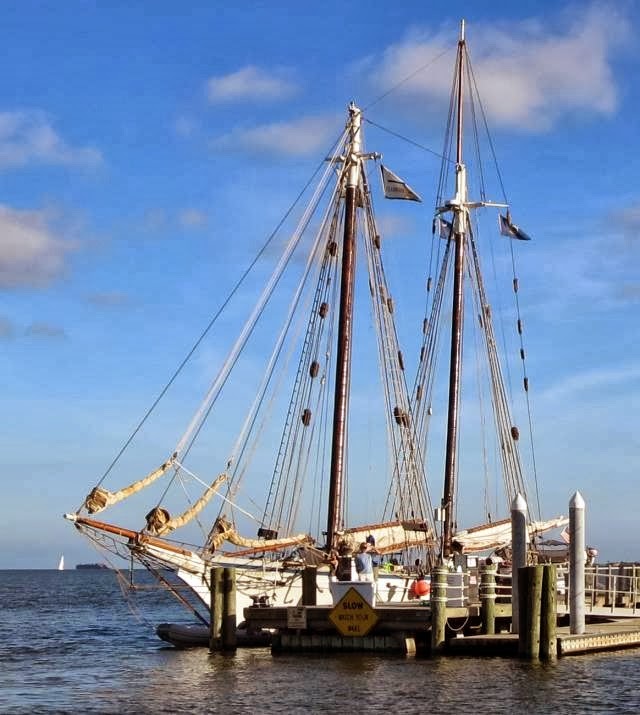 We continue making good time and expect to make Fernandina by Wednesday for a two day stay. Florida, here we come! We usually go from Charleston to B&B Seafood which is really out in the boonies but the tides were not right. Low tide was around noon which coincided with entering the shallowest part of the ICW between Charleston and Savannah, not good. So we settled for a shorter day and the anchorage at Steamboat Creek. The great advantage for us is the public dock for easy Hoolie relief. As usual, Ann piloted the boat while I set the anchor. She picked a spot right in front of the docks to make the trip short for Hoolie. Needless to say, our 66 lb anchor grabbed right away. There's no moon out tonight since the sky is cloud covered and it's pitch black outside, real wilderness. The weather is rather warm so we're running the genset tonight with the A/C on to cool off the boat. On Saturday we'll have a 52 mile day to reach Hilton Head but we'll have the advantage of passing through all the trouble spots with a high tide, plan ahead I say. 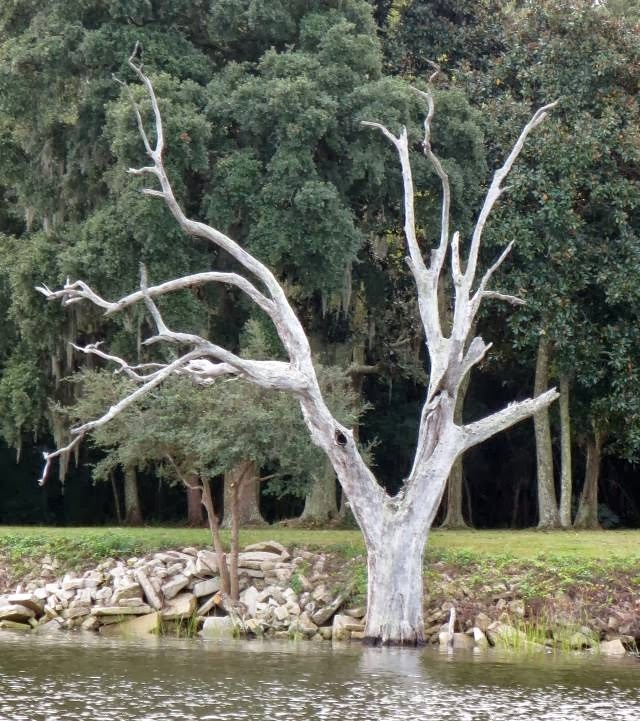 The ICW is really deteriorating. The depths are such that many places cannot be navigated at low tide so you have to plan your passages. 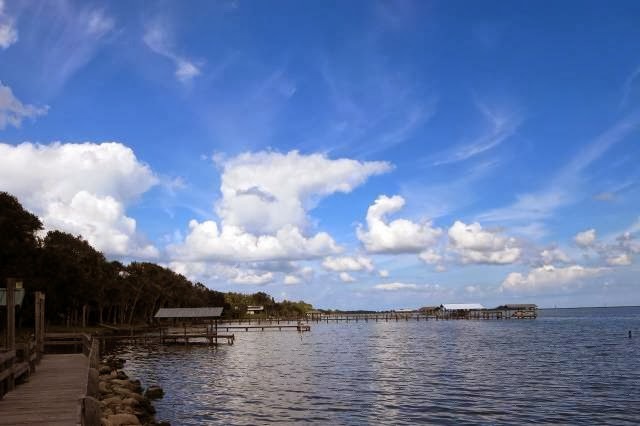 The ICW is supposed to be kept at a minimum of 12 ft at low tide and in many places it's more like 1 to 2 ft! Luckily, there's 7 foot tides down here so it's still possible to make a passage - at least until it fills in some more. So we're targeting a 7:30 am anchor up departure and shouldn't have any trouble with the shallow area given the high tides. We are still about a week ahead of last year's progress due mainly to all the good weather (except for two days of rain), we'll take it anytime. 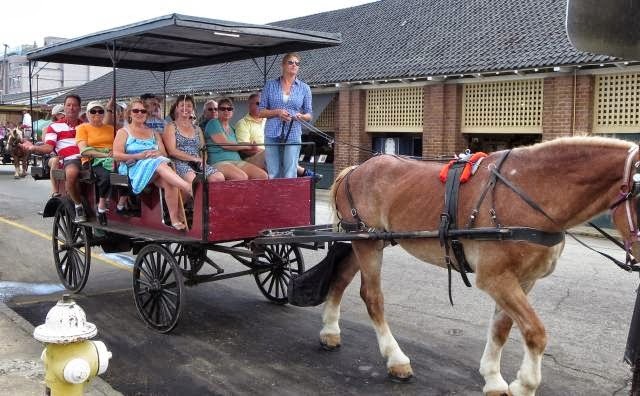 For rides around town, take a carriage! We finally got our act together and started our walk to downtown, about five blocks away, around 1:30. We really do not adhere to schedules on days other than when we have to in order to take advantage of the tides or good weather. We've been spoiled by our extended vacation, I'd recommend it for everyone. The weather is just glorious with blue skies and temps in the mid 70's! 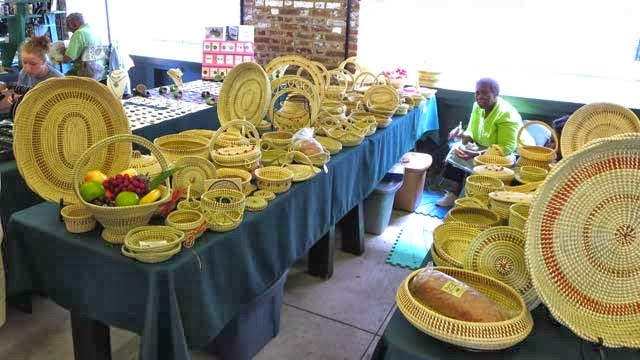 Downtown has all the high-end shops you would expect of a good shopping area and many places to eat. They even have an Apple store. 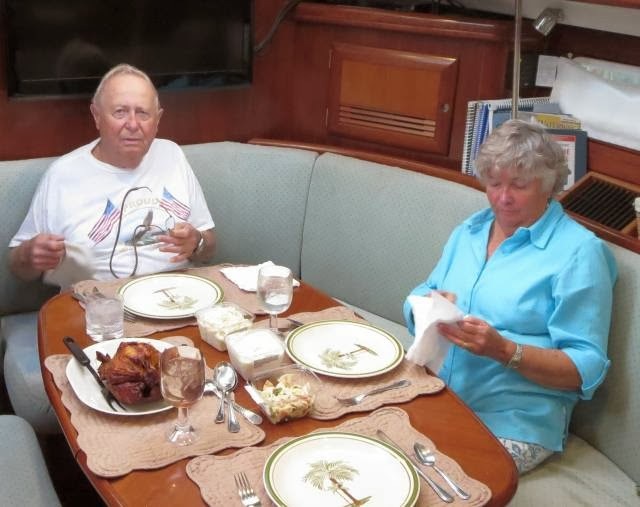 However, except for special occasions, we prefer to have our dinners on the boat so we stopped by Harris Teeter on the way back for fresh pork and a seafood appetizer. I got my replacement propane tank pigtail, this time it fits the pressure regulator! So now we once again have a working stove. 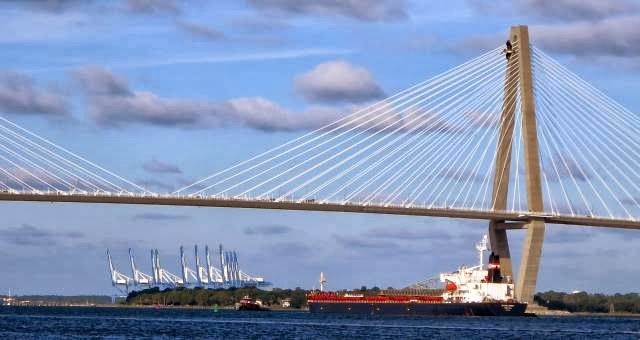 We plan on leaving Charleston Friday for Steamboat Creek, then a Hilton Head RV Marina and then Savannah at Hinckley Marina on Sunday. We just plan on staying one day before heading south again on Monday. 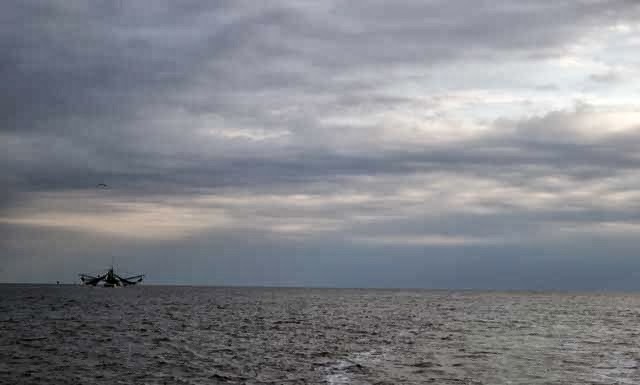 We're about a week ahead of last year and roughly two to three weeks ahead of most of the boats heading south. The weather has been so wonderful (and the hurricane season so tame) that we've taken advantage of every opportunity to go south. 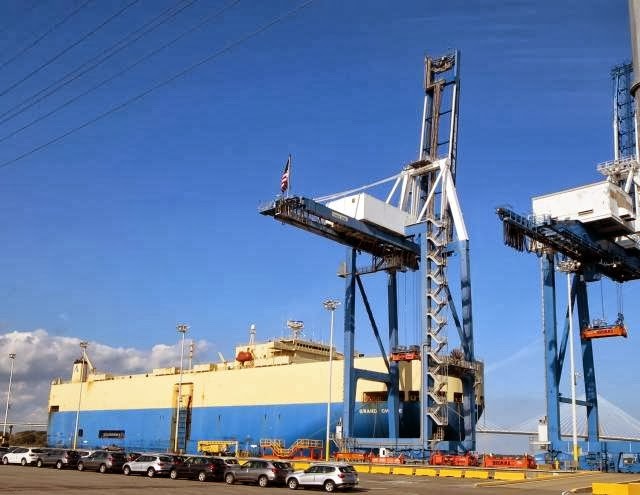 Charleston is a major port, this huge ship is dwarfed by the unloading cranes! The weather is warming up nicely but before we can go out and play (tour downtown Charleston) there was work to be done. The Maritime Center has two washers and two dryers, both free. However, that attracts everybody and especially the kids on the "Ocean Classroom" aft of our boat (the photo yesterday). They all crowd around the machines, hard to get a time slot. Ann spent most of the day sitting by the washers to be sure we got our laundry done (great fun?) Meanwhile, it comes a time when the diesel has to be attended to and today was oil change day. I had already bought the oil (Shell 15W-40) at Walmart, they have the best prices as you would expect, and used a vacuum pump to get the oil out. I've found that all marinas have some provision for disposing of used oil and the Maritime Center was no different. Having completed our tasks for the day, we visited our favorite supermarket, Harris Teeter and stocked up for the rest of the trip. Fresh salmon was on the menu tonight along with sushi as an appetizer, all very good. I am also waiting for a new pigtail hose for the connection between the propane tank and the regulator. I had ordered one last week and had it sent to the Maritime Center but when I went to screw it on, I found it did not fit! I had thought, a pigtail was a pigtail, never dreaming there were different kinds. I mean, how many ways can you connect a propane tank on a boat to a pressure regulator? Apparently, more than one way. I wound up ordering one directly from Beneteau which I should have done in the first place, live and learn. So if you ever have to replace a leaking pigtail connector (20 inches long), beware and check for the proper connection on the end that goes to the regulator. The end that plugs into the tank is standard. 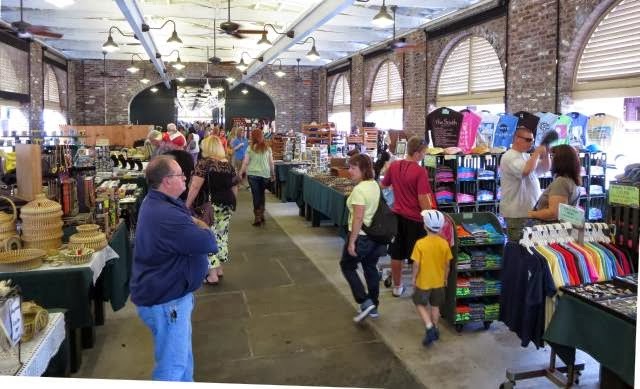 Thursday is "explore downtown Charleston" day so we'll see what they have to offer and take pictures. On Friday we'll shove off again and probably anchor out at Steamboat Creek depending on how far we get and the state of the tides. Many large ships come through here - but the bridge is higher! 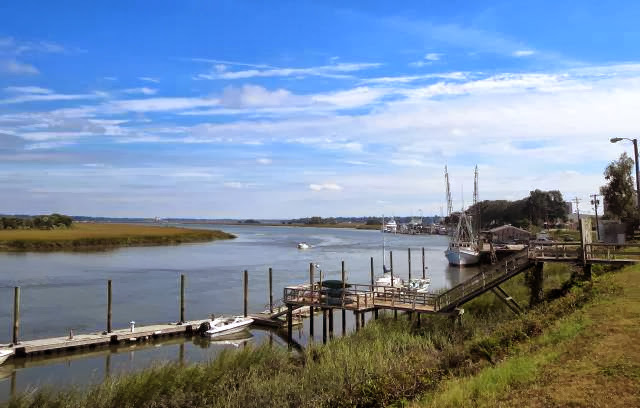 We had intended anchoring out at Awendaw Creek, one of our favorite anchorages but the tides were favorable for an afternoon run to Charleston so we pressed on. 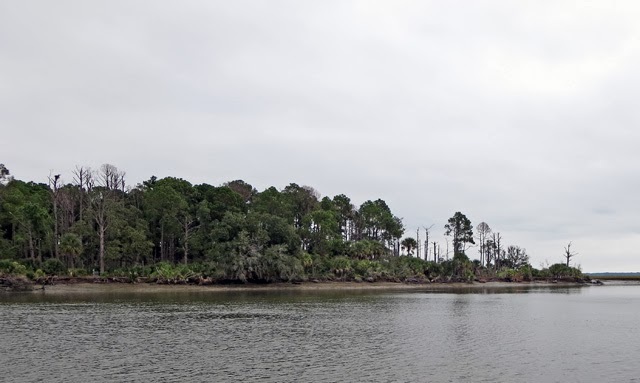 The route from Georgetown to Charleston is one of the most shallow on the ICW. It's okay for the most part but the 3 miles just before the Ben Sawyer bridge is in need of dredging in the worst way. We were down to 3.7 ft at low tide but since we were passing through with a three foot tide, we had enough at 6.7 ft for our 5 ft keel. However, it was real nervous time waiting to see if you were going to hit bottom or not! Eventually we made it through and beat the 4:00 closing of the Ben Sawyer bridge (it doesn't open between 4:00 pm and 6:00 pm). A couple in a boat that we passed missed the last opening by 10 minutes and had to wait 2 hours for the next opening! We are here now in Charleston Maritime Center at one of their docks. It's not very big but we like it due to the proximity to downtown and most importantly, a good Harris Teeter supermarket within walking distance. The marina here also has free laundry machines so we'll make good use of that tomorrow. We plan on spending three days here which lets the tides slide further into the afternoon so the high tides will be more favorably placed later in the day for the skinny waters to come. You have to plan ahead for tides when going down the ICW nowadays.